Imagine you have designed a part, only to find out later the predicted maximum stresses are in fact lower. It’s too late to make any design modifications, and now your part is produced for a maximum stress it may never encounter, or in other words, the part is overdesigned. Question: What are some causes of overdesigned fiber reinforced plastic parts? Answer: I’m sure there are dozens of reasons, but below I’ve only outline two causes in regards to FEA. Representing reinforced plastics as isotropic adds a great deal of conservatism to a simulation. 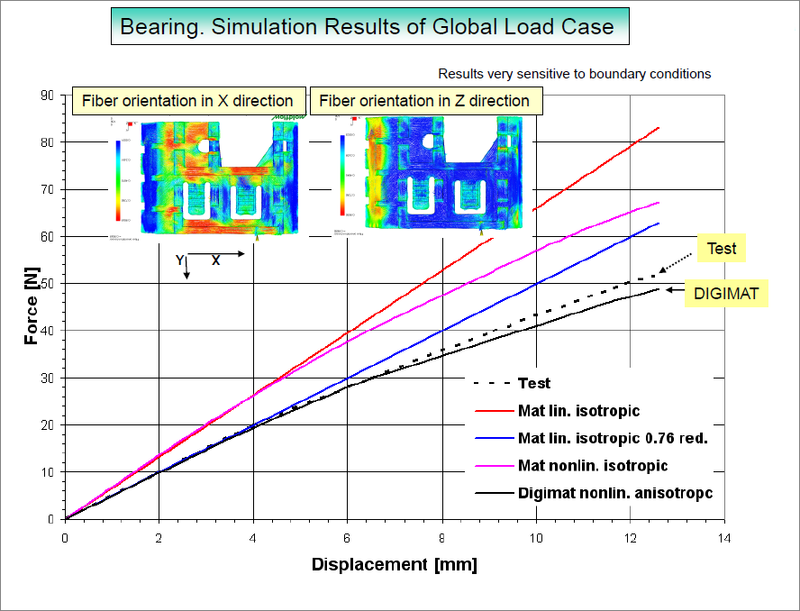 For improved FEA accuracy, represent your fiber reinforced plastics as anisotropic as mentioned in my previous post. To fix this, take the final fiber distributions predicted in injection molding software and bridge them with FEA early in the design stage. This image below sums up my post. In the fringe plots, you can see how injection molding will result in varying fiber orientations. It is important to perform FEA that reflects the likely fiber distributions. This would involve mapping your fiber distributions from injection molding simulations to your FE meshes. Also, if the fiber reinforced plastic is characterized as isotropic, your FEA, red, pink, and blue curves, will be far from test as the plot shows below. It is not until you supply your model with nonlinear anisotropic material information from Digimat, that your simulations better reflect experiment.